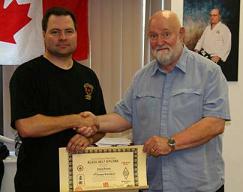 Interested in martial arts training for police work like the RCMP or other forms of law enforcment? You should know that not all styles of martial arts are well-suited for practical application in a police / law enforcement context. Can-ryu Jiu-jitsu has a long history of development with specific emphasis on usage in police work. Professor Georges Sylvain, founder of Can-ryu (seen on the right of the photo here) served as a military police officer during the Korean War and as a municipal police officer for 15 years in Ottawa. He was also Chief Instructor of physical defense training at Algonquin College in Ottawa for its Law and Security program, having taught there for 25 years, in addition to having been Chief Instructor to RCMP self-defense instructors in Rockliffe, ON before they were relocated to Western Canada. In addition to his instructive capacities, Professor Sylvain has also served as an expert witness in self-defense and has testified on the behalf of a number of police officers. Steve Hiscoe Shihan (seen on the left of the photo here), 8th degree black belt and heir apparent to the style of Can-ryu, is a 20-year veteran RCMP police officer with the rank of Corporal. He is currently assigned to the RCMP Training Academy in Chilliwack and is responsible for training and coordinating the assignments of the academy's instructors. The Police Pressure Point System. This system is made up of the most practical, safest, most effective, and easily accessible nerve motor and pressure points in the human body. It's easy to learn, with techniques that can be successfully applied by both men and women. Their use is easily defended in court because of their low propensity to cause serious injuries. High Stress Sparring Drills. This sparring system teaches how to handle combat stress, which occurs when people are faced with active aggression. Combat stress occurs as a result of adrenaline. And while adrenaline makes you temporarily stronger and faster, the resulting combat stress causes dexterity and coordination to drop off remarkably, not to mention other sensory experiences, such as tunnel vision, auditory exclusion, and time distortion. High stress sparring drills gives students the opportunity to learn how to deal with the physical and mental effects of stress. Sparring begins with one-on-one scenarios, eventually moving on to handle multiple attackers. The Simple Hold Escape System. Our hold escape system is based on the concept of "commonality of technique." We teach simple defenses that can be used against a variety of attacks from similar positions, rather than teaching a wide variety of techniques that can cause dangerous brain stalls during which a person becomes confused as to which defense to use. Our system also relies primarily on gross motor skills making the system easier to learn and apply, while under the effects of combat stress. Throws & Takedowns. Our primary throws and takedowns have been carefully selected for their self-defense value and ease of application in a close body contact situation. We always demonstrate the use of strikes and other defensive techniques that serve to distract an attacker making it easy to take them to the ground. Come-alongs & Controlling Techniques. These techniques are practical for use against assailants who offer resistance when being apprehended or arrested. They make use of pain compliance through pressure point applications and joint manipulation. Defense Against Weapons. Police and other law enforcement officers are far more likely to be faced with weapons in their line of work. We have a practical system of defenses against the weapons that are most commonly used on the street. It is based on using distractive measures, evasive manoeuvres, and the development of a strong sense of distance and timing. If you're a member of the RCMP, VPD or other municipal police service, GVTAPS, etc. or you're a corrections officer, deputy sherriff, customs officer, etc, you'll develop skills in our classes that you'll find useful in the field. To experience the effectiveness of Can-ryu Jiu-jitsu for yourself, contact us to set up an appointment to do 2 free trial classes. Contact Us Today & Try It Free! How Much Force Can You Use for Self-Defense?